Today's OneCity expansion project announcement by councillors Karen Stintz and Glenn De Baeremaeker and the accompanying map is perhaps the closest thing we've had in a while to a TTC fantasy that actually has a chance of coming true. Just how good that chance is depends on who you talk to, but at least parts of the proposal â specifically the idea of raising funding for transit via property tax revenue â seem quite possible indeed. If the proposal gets a thumbs up from council and clears a long list of hurdles, Toronto will add six new subway lines, 10 LRTs and five bus and streetcar routes to its existing network over the next 30 years. Here's a round-up of the new lines proposed under the OneCity plan. Click here for a larger version of the map. Build a Don Mills Express line east from King station into Leslieville and up Pape to the Eglinton LRT. Build a Scarborough and Etobicoke Express line from Pearson to Steeles via Union. Replace the Scarborough RT with an extended Bloor-Danforth line to Sheppard and McCowan. Extend the Yonge line to Steeles Avenue. Extend the Sheppard line west to Downsview station, linking the Spadina and Yonge lines. Build a Waterfront East streetcar from Union Station to Parliament Street. Build a Ellesmere bus rapid transit line (BRT) from Scarborough Centre via Sheppard to Kingston Rd. Extend the St. Clair streetcar to Jane. Build a Kingston Road BRT from Victoria Park station via Eglinton. Build a Wilson BRT from Wilson station to Keele Street. All this adds up to 175 kilometers of new transit infrastructure. 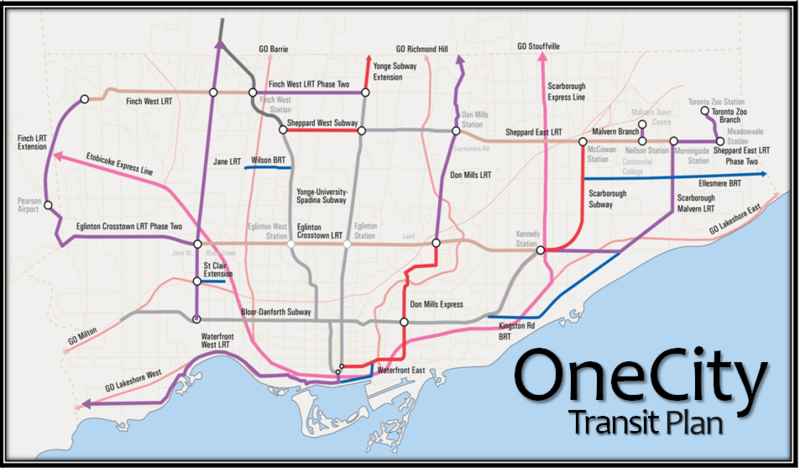 With a whopping $30 billion pricetag (that Stintz is confident we can afford) and a necessary long term commitment, is it likely OneCity will be realized, or will it go the way of Network 2011 and many other transit promises that have broken along the way? Another big question is what Metrolinx will ultimately have to say about all of this. The so-called Big Move covers some of the same territory, and the relationship between the TTC and the provincial transit agency hasn't exactly been picture perfect over the last few months. But perhaps the key thing that separates this plan from others is that there's a clear funding strategy for at least a third of price tag (who knows if the province and the feds will kick in the rest?). Even if the rest of the money doesn't materialize, we could get a hell of a lot done with $10 billion over the next 30 years. Will property owners ante up for our transit future? The OneCity website went live this morning. You can read up about the various elements of the proposal there. Here's what Stintz and De Baeremaeker have to say by way of introduction.